There’s no doubt the 12 ­nation Trans-­Pacific Partnership currently being negotiated by the Obama administration is a political hot potato. Will the trade deal destroy or create more American jobs? Should the United States seek to strengthen intellectual property rights in these other countries? Should a baseline of human rights be a prerequisite for membership in the partnership? Is it right to remove disputes arising under the agreement from a nation’s domestic court system? These are some of the controversies swirling around the trade deal, which Congress has authorized the president to present for an up­or­down vote once negotiations with the 11 other countries are concluded. Meanwhile, there’s a core assumption underlying the argument in favor of the TPP in this country that isn’t being contested, but deserves a second look: Supporters hold up the ambitious Pacific trade deal that excludes China as a way to contain and counter China’s dominant influence. This is a flawed assumption that is leading the U.S. and its partners into a strategic blunder, needlessly complicating Pacific trading patterns and exacerbating tensions with Beijing. It’s naive to believe that China can be locked out of a preferential trading network. Asserting that the TPP can be a counterweight to China might sound good on Capitol Hill and in other policy forums, but it’s not an assertion that survives an encounter with economic realities, the pattern of cross­border investments in Asia, and the existing web of trade agreements already in place. Just follow the supply chains out there, our form of connecting dots as researchers, and you will see. The dozen nations negotiating the TPP are the United States, Japan, Australia, Peru, Malaysia, Vietnam, New Zealand, Chile, Singapore, Canada, Mexico, and Brunei Darussalam, which account for 40 percent of global trade. The U.S. already has free trade agreements with some of these countries (for example, Canada, Chile, Mexico), and many believe that establishing new free trade relationships with Japan and Vietnam under the TPP framework will thwart China’s ability to dominate industries such as automobile, telecom equipment, and clothing manufacturing. It’s naive to believe that China can be locked out of a preferential trading network. Despite its present currency and stock market corrections (all part of the transition to a “normal” market­based economy), China recently overtook the U.S. as the world’s leading trading nation and it is determined to become the world’s largest economy this decade. By the end of 2014, China had invested $870 billion worldwide in an effort to expand its sources for raw materials and industrial components. For example, China’s investments in Bangladesh ($3.8 billion) and Pakistan ($17.8 billion) outstripped the loans those countries received from the IMF, which gives it a greater say in those countries’ economies and political debates. In another example of how Beijing pursues its commercial and strategic interests, China has asked for a share of Angola’s oil reserves in exchange for its investment in that nation’s road development. This is in addition to its well-known, aggressive investments in mining companies across Africa. 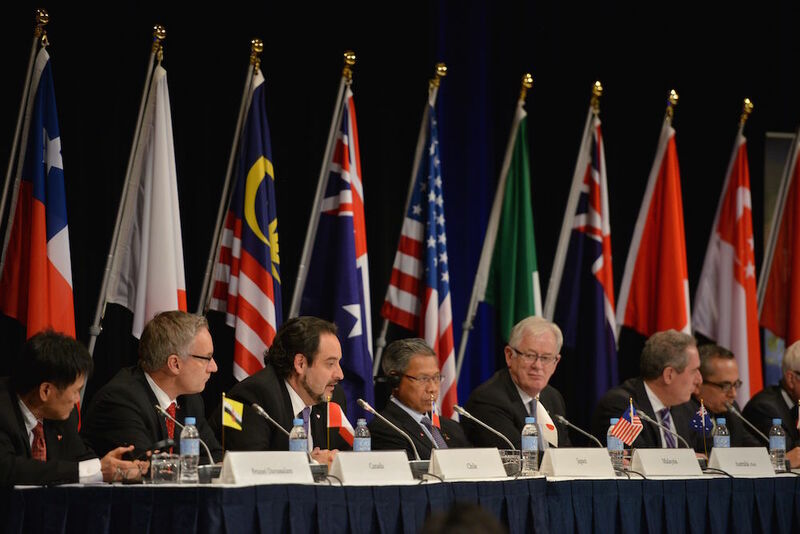 To support infrastructure construction closer to home in the Asia­Pacific region, and expand its sphere of influence, China proposed an international financial institution (the Asian Infrastructure Investment Bank) in 2013 that was supported by 47 regional and 20 non­regional members, including TPP nations such as Australia, Brunei, Malaysia, New Zealand, Singapore, and Vietnam. China has also been busy establishing its own free trade agreements. Since 2005, China has already established such deals with TPP nations Brunei, Chile, Malaysia, New Zealand, Singapore, Peru, and Vietnam. This is a crucial point in understanding the flawed logic behind any belief that China could be excluded from a preferred cross­Pacific trading community. Here’s where supply chains come in. Given its investments in other developing countries, China has the capability to design, develop, and produce products that can easily make their way into the U.S. market via TPP intermediaries, thereby reducing tariffs it might otherwise have to pay. For example, to satisfy certain country­of­origin conditions stipulated in TPP, China can manage the supply chain operations of cotton shirts as follows: China can import cotton from Pakistan (via its existing free trade agreement with China) and conduct “upstream” operations such as fabric design, knitting, and dyeing in China. Then China can ship the fabric to Vietnam (via an existing free trade agreement with China). At the same time, Japan can ship the buttons to Vietnam (via the TPP). Vietnam can perform “downstream” operations (sewing) and then ship the finished shirts via TPP agreement to Australia, Japan, and the United States, cutting off the 5, 10.9, and 16.5 percent import duties that would have applied if China had dealt directly with these countries. Even if China failed to establish trade deals with the remaining 5 TPP nations and stays out of the partnership itself, the country can leverage its supply chains to facilitate multilateral trade with minimum tariffs. In fact, some mid­size Chinese companies such as Texhong Textile have already opened facilities in Vietnam in anticipation of the TPP. Much as some of Wal­Mart’s internal sourcing from Chinese operations to American consumers are considered Chinese exports to America, Texhong’s internal sourcing of semi-finished garments from China to Vietnam and then onto the U.S. will appear as trade between the three countries, covered by free trade agreements. Worse than just being unrealistic and uninformed, excluding China from the TPP exacerbates political tensions between the world’s two leading economic powers. Even as they find a workaround, China’s leaders don’t exactly appreciate our efforts to exclude them from the trading party. And they’ll make their own moves to outflank the TPP. Already in 2012, to mitigate perceived and real consequences of not being invited to join the TPP, China launched negotiations for a Regional Comprehensive Economic Partnership—a proposed free trade agreement between the 10 ASEAN countries (Brunei, Myanmar, Cambodia, Indonesia, Laos, Malaysia, the Philippines, Singapore, Thailand, Vietnam) and six additional countries (Australia, China, India, Japan, South Korea, and New Zealand). It also accelerated its own bilateral trade negotiations with South Korea, Japan, and Australia. The result of all these diplomatic thrusts and counter moves could very well be the absurd and confusing emergence of two overlapping trading blocs that need each other economically, but distrust each other intensely. Wouldn’t it be far better to increase economic efficiency and improve political understanding with Beijing by constructing a TPP that includes China as a charter member? China’s importance as Asia’s manufacturing hub, and as America’s top trading partner across the border, are facts of life, ones that can’t be contained or wished away. Whatever other issues are raised by the TPP debate in Washington these days, it’s time to add a pretty basic one: Why exactly would we enter into a Pacific partnership agreement without seeking to include our top partner in the region? Felipe Caro is an associate professor in decisions, operations, and technology management and Christopher S. Tang is a distinguished professor and Edward W. Carter chair in business administration at the UCLA Anderson School of Management.